Tetsuya Ishida, "Body Fluids," 1998. Courtesy of the Internet. Saving the World with a Brushstroke, the most recent special exhibition at the Asian Art Museum, is an introspective body of work by Japanese artist Tetsuya Ishida (1978–2005). Ishida used his paintings as a cathartic expression of his darker emotions and believed, as evidenced by the title, that making and looking at art served an important social function that could elevate and transform lives. While the dark, dreamlike quality of his work gives the viewer insight to the emotional trouble Ishida faced throughout his short life, he often insisted to friends and family that he was happiest in his studio painting. 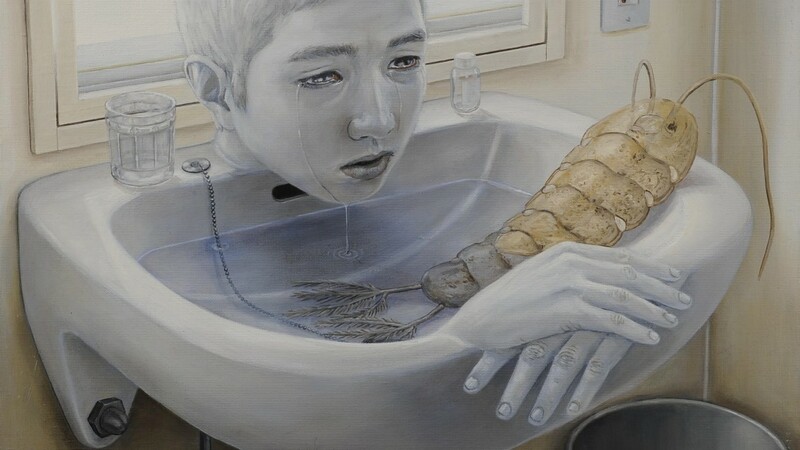 Tetsuya Ishida, “Prisoner,” approx. 1999. Acrylic on board. Courtesy of private collection. © Estate of Tetsuya Ishida. His work was misunderstood in Japan during his lifetime, gaining recognition after his death thanks to a small group of curators and the recent showing of his work at international fairs such as Art Basel Miami. 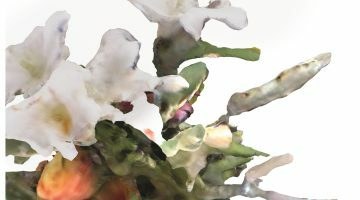 This disconnect between Ishida’s work and his audience speaks perhaps to larger sociological questions within Japanese cultures that Ishida reflected in his work—urban alienation, repression of self, and a societal pressure to achieve. He often portrays himself isolated from other humans and merging with inanimate objects around him. A recent discussion with his a representative of his artwork at Art Basel Miami revealed that many of these images display Ishida’s dark sense of humor. For example, Contact (approx. 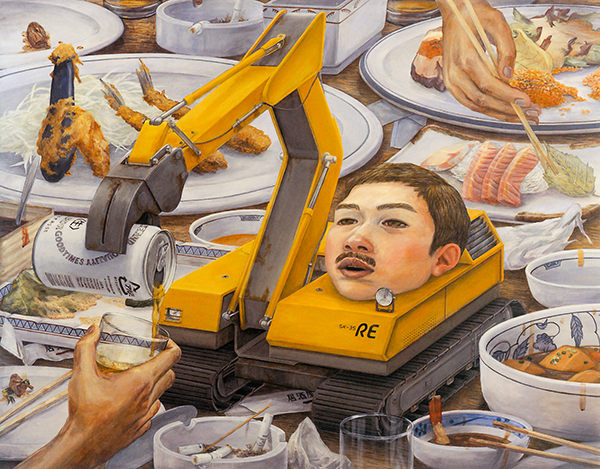 1998), an image of Ishida’s head on the body of a cherry picker serving someone a beer at a sushi restaurant, is a tragic, but quietly funny satire of Japan’s obsession with novelty technological tools created as substitutes for even the most basic of human interactions. 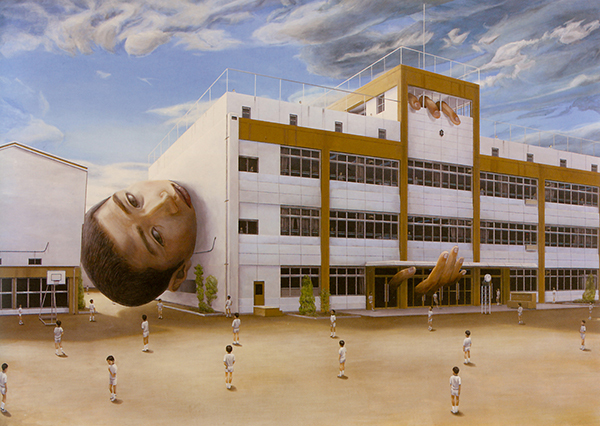 Tetsuya Ishida, “Contact,” approx. 1998. Acrylic on board. Courtesy of private collection. 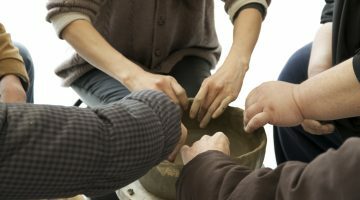 © Estate of Tetsuya Ishida. Ishida’s work is rendered with careful detail that creates an air of stillness in each of the paintings. The slowness of the brushstroke invites the viewer to take approach the work with the same speed, taking in every inch of the paintings in the same methodical way that they were made. Like Alice in Wonderland, the artist’s scale shifts quickly from very big to very small from one painting to the next. In Prisoner his body is enlarged to the size of an office building and encapsulated with only his hands and head sticking out, while uniformly dressed young men stand at disparate intervals in the plaza in front of him. 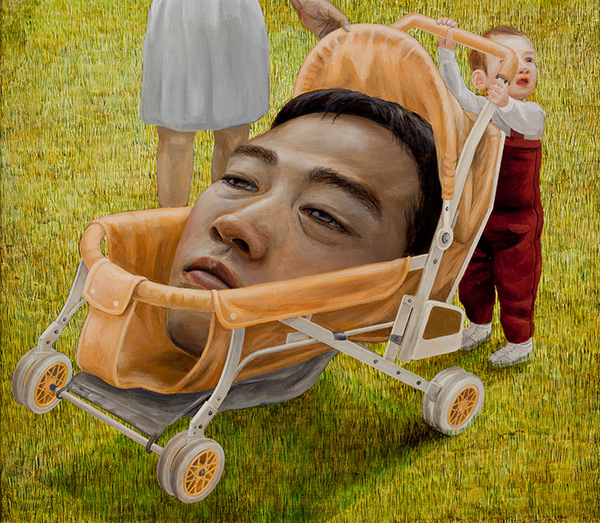 In On Holiday a baby pushes Ishida’s oversized head in a stroller. Whether you appreciate his dark humor or think his work is capable of saving lives, Ishida’s paintings offer a poignant critique of contemporary Japanese culture that is worth a look. 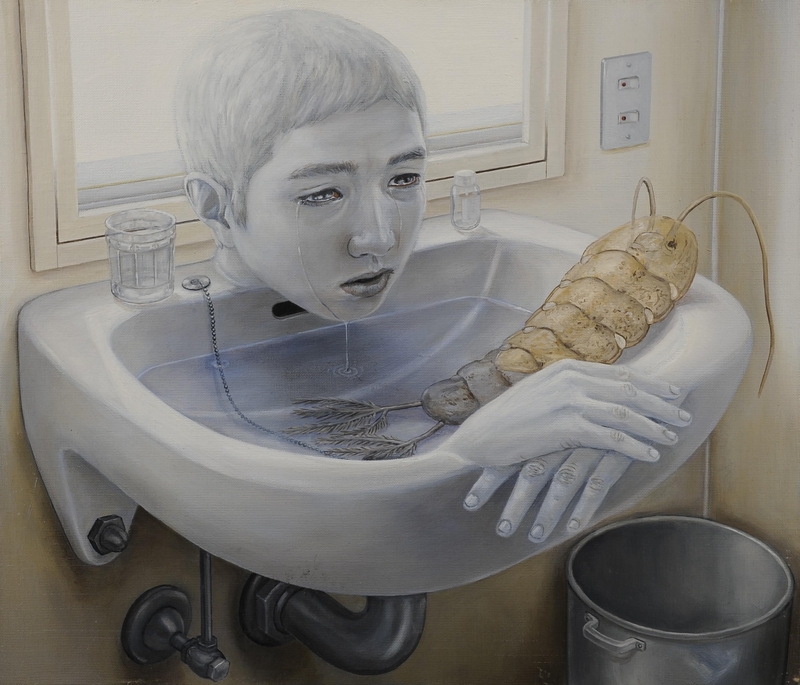 Tetsuya Ishida, “On Holiday,” approx. 1999. Acrylic on canvas. Courtesy of private collection. © Estate of Tetsuya Ishida. Next post In Conversation: Lawrence Ferlinghetti With John Held, Jr.